Jan Zelezny's Olympic Record of 89.66m in the 1992 Barcelona Olympics javelin throw final. Coached by Miklos Nemeth, Zelezny won the Olympics with his first throw, just like Nemeth in the 1976 Olympics. Ferenc Paragi's 96.20m javelin throw in Cwmbran, UK on May 18th, 1980. Just 52cm (20") short of the world record, set by Paragi a few weeks earlier. Janis Lusis's Olympic Record of 90.10m at the 1968 Mexico City Olympics. It was an exciting Olympic javelin throw final. In the first round Kinnunen's 86.30m was the longest throw. In the second round Lusis threw 4 cm (less than 2") farther and took the lead. Then in the fourth round the Hungarian Gergely Kulcsar threw a personal best - 87.06m. He was leading the group until the last round, when Kinnunen threw 88.58m, but Janis Lusis was even better: 90.10m, Olympic Record, which was the winning throw. shoulders and every nerve. You must send a chunk of will after the slender equipment: fly farther! Klaus Tafelmeier's European javelin throw record of 84.76m in Stuttgart, 1986. A few weeks later he achieved 85.74m in Como, Italy, which, at the end of 1986, became the first official world record with the new javelin. Räty's 91.98m world record throw set in 06 May 1991, in Shizuoka, Japan. 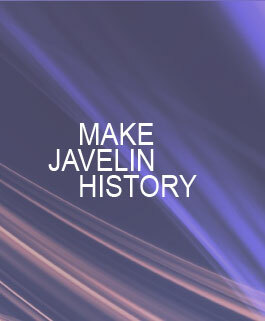 The javelin used was a rough surface type, which was declared as illegal by the IAAF in August, 1991, so this record, along with Räty's 96.96m WR set a month later, was retrospectively deleted. The world record was set back to 89.58m, thrown in 1990 by Steve Backley.